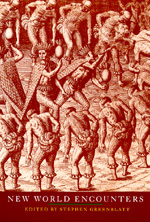 The discovery of the Indies, wrote Francisco López de Gómara in 1552, was "the greatest event since the creation of the world, excepting the Incarnation and Death of Him who created it." Five centuries have not diminished either the overwhelming importance or the strangeness of the early encounter between Europeans and American peoples. This collection of essays, encompassing history, literary criticism, art history, and anthropology, offers a fresh and innovative approach to the momentous encounter. Stephen Greenblatt is The Class of 1932 Professor of English Literature at the University of California, Berkeley. Two of his publications, Shakespearean Negotiations: The Circulation of Social Energy in Renaissance England and Representing the English Renaissance (of which he is the editor) are available in paperback from California. His most recent book is Marvelous Possessions: The Wonder of the New World (1991).